Geelong, overlooking Hobson’s Bay, has been the second largest city in Victoria since the 1930s. At the 1933 census its population of 43,353, just topped Ballarat’s at 41,658. The gold rushes of the 1850s and 1860s saw Ballarat and Bendigo outstrip Geelong to become Victoria’s great inland cities. Geelong, with its port, grew on gold exports and serving the woolgrowers of the western districts. A rail link between Melbourne and Geelong opened in 1857, and the line to Ballarat opened in 1862. Ballarat did not have a direct rail connection to Melbourne until 1889. In the late nineteenth and early twentieth century Geelong saw notable industries around wool, from exporting bales to woollen mills, both now commemorated in the Wool Museum in Central Geelong, housed in an elegant bluestone warehouse. Geelong has suffered from marked industrial decline, with the closure of woollen mills and the coming closure of the Ford car plant. Geelong retains an oil refinery and a major grain terminal. Geelong is only one hour on the train from central Melbourne, so its affordable housing makes it attractive to some Melbourne workers. And, as the gateway to the Bellarine Peninsula and the resort towns of Torquay, Apollo Bay and Lorne, along with the ‘Great Ocean Road’, it has many attractions within easy reach. The CBD has been rejuvenated with Deakin University, established in 1974 on an outer suburban campus at Waurn Ponds, taking over a number of the otherwise redundant warehouses overlooking the port. Geelong, Victoria’s largest provincial urban region, is 65 km from central Melbourne across the Port Phillip and Corio Bays. It is on the Princes Highway between Melbourne and Victoria’s Western District. Hume and Hovell, explorers, recorded the Aboriginal word 'jillong' in 1824, thought to mean land or cliffs, when they came to Corio Bay. The name 'Geelong' was derived from the Aboriginal word, and was given to the area by Governor Bourke in 1837 when he visited Port Phillip to also formally name Melbourne and Williamstown. In June 1835, John Batman crossed Bass Strait from Tasmania and claimed treaty lands from local Aborigines. The western boundary of Batman’s treaty land included Geelong. Seventeen months later two of Geelong’s European settlers, John Cowie and David Stead, came from Tasmania to the Geelong district to depasture sheep. The Manifold brothers landed sheep at Point Henry two months later. Early in 1837 a pioneer Geelong citizen, Dr Alexander Thomson, settled at the future Geelong suburb of Belmont, and established his Kardinia estate overlooking the Barwon River. In 1838 shipping activity caused a customs house to be constructed. It has survived as one of Victoria’s oldest buildings, a round portable structure, and is in the Geelong Botanic Gardens. A town survey was made and land sales were conducted in February 1839. The Woolpack Inn (later Mack’s) was opened in 1839 and the Geelong advertiser began publication the following year. St John’s Presbyterian church was opened in 1841. The sandbar blocking access past Point Henry was successfully passed over, and cargo movements were henceforth shared between Point Henry and the Geelong waterfront. During the late 1840s churches and schools were established and local industries such as flour mills, tallow works and vineyards were established. The Geelong town council was incorporated in October 1849. In the year before the gold discoveries at Ballarat and Bendigo the first Bright and Hitchcock’s store was opened. It became a Geelong landmark until acquired by the Foy and Gibson’s chain in 1959. The opening of the goldfields greatly increased Geelong’s maritime activity, not least because the inland route to Ballarat was flatter than the one from Melbourne over the Dividing Range. Outwards traffic also increased with wool from the Western District pastoral properties. The rapid growth also brought Geelong’s second major retailer, Morris Jacobs, whose store was also a landmark until acquired by Myer Melbourne in 1950. 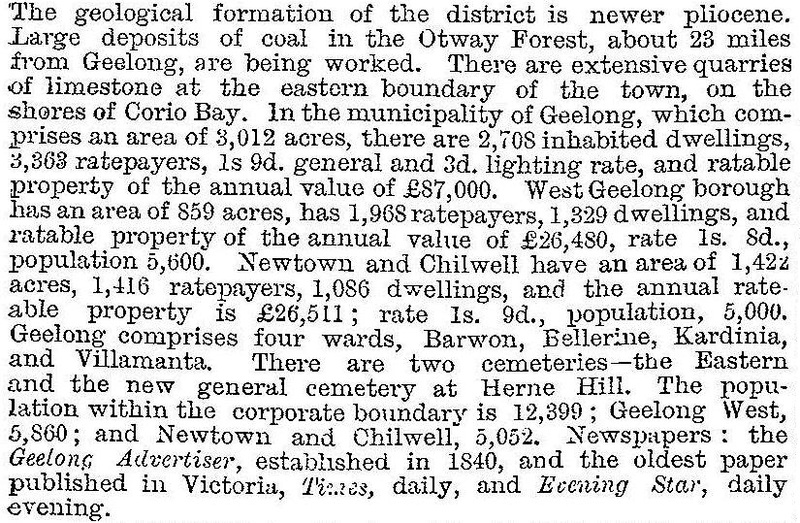 Geelong’s population went from 8000 in 1851 to 22,000 in 1853. It thereupon stabilised, not reaching 30,000 for another sixty years. During the late 1850s some of Geelong’s notable institutions and buildings were created: Geelong Grammar School and Geelong National Grammar School (later the Matthew Flinders Girls’ Grammar) in 1858, the Town Hall, Market Square, the mechanics’ institute, and the railway connection to Melbourne was opened. In the municipal sphere Geelong’s future was curtailed like Melbourne’s, with the creation of closely adjacent road districts and suburban councils: South Barwon and Bellarine/Indented Head roads districts, Corio shire to the north, Newtown borough (1858) and Geelong West borough (1875). The resulting patchwork became the obvious first candidate for municipal reform in 1993. The Geelong council’s area was 13.4 sq km, less than a sixth of greater urban Geelong. The Geelong mechanics’ institute fostered a technological school in 1869, which evolved to become the Gordon Technical College (1887) as a memorial to General Gordon of Khartoum. Extension of curricula led to it becoming the Gordon Institute of Technology (1921) and expansion to a campus at Waurn Ponds (1971), later Deakin University. In the postwar years Geelong entered a glorious period of growth. Successive football premierships (1951-52) were won and local cyclist Russell Mockridge, won two gold medals at the Helsinki Olympic Games. Population growth was rapid as postwar migrants settled in new suburbs. The Shell Oil Refinery opened at Corio in 1954, and the on-rush to modernity saw retail takeovers from Melbourne and the closure of the electric-tram services. The Alcoa aluminium refinery was opened at Geelong’s pioneering landing place, Point Henry, in 1963. It employed over 500 people before closing in 2014. Between 1947 and 1965 greater Geelong’s population went from 58,400 to 101,600 persons. The rapid development beyond central Geelong resulted in small old industrial premises becoming under-used or abandoned. The mixed-use core of Geelong, with a network of lanes for access to small subdivisions and loading yards, became anachronistic. Urban consolidation for redevelopment overtook older areas, much like inner Melbourne underwent site consolidation during the 1960s-80s. Market Square was developed in 1985, adding a department store, supermarket and 95 shops. Three years later in the adjoining block to the north Bay City Plaza was built with a department store, discount department store and 82 shops. The two sites added 45,200 sq metres of retail floor space to Geelong, bringing it to over 160,000 sq metres. It had been some years since electric trams took people shopping, as buses took over from them in 1954. In 2013 the Gillard federal Labor government announced that Geelong would be the headquarters of the national disability insurance scheme, DisabilityCare. In 1978 the Wathaurong Aboriginal Cooperative was formed by the Geelong Aboriginal community to support the social, economic and cultural development of Aboriginal people within the Geelong and surrounding areas. Wathaurong is the name denoting the family groups of the Kulin Nation of Aboriginal people whose traditional boundaries span the coastline from the Werribee River to Lorne Peninsula, extending westerly towards Ballarat. The Geelong city council boundaries extended from Rippleside at the western end of Corio Bay, along Western Beach and Eastern Beach and ended at Eastern Park, just beyond Limeburners Point. Eastern Beach with breakwater jetties and a swimming enclosure are the most notable amenities. Eastern Park contains the Botanic Gardens, which have numerous rare exotic trees, sports facilities and the Geelong High School (1910). There are several foreshore reserves, smaller reserves, Johnstone Park beside the town hall and art gallery and Kardinia Park at Geelong South, home of the Geelong Football Club since 1940. Geelong’s commercial and retail centre runs along the Moorabool Street spine of the town’s 1838 survey. The waterfront end contained several wool-export and commercial buildings which were refurbished in the 1990s. The Dennys Lascelles warehouse (1872) Moorabool Street, became the National Wool Museum in 1987. The retail heart runs along the east-west Little Malop Street pedestrian mall, adjoined by the redeveloped Market Square. Immediately south of the commercial area there are three Catholic educational institutions and St Mary of the Angels church, the Matthew Flinders Girls’ Secondary College, the Swanston Street primary school (1871-1993), the South Barwon Secondary College (formerly Geelong Technical School, 1913) and the Geelong Hospital (Kitchener Memorial Hospital, rebuilt 1922). Beyond these institutions is Geelong South, served by a railway station near the Kardinia Park football ground, Kardinia Park also has netball courts, a swimming centre and an elderly citizen’s club. The football ground has been progressively upgraded. There is a neighbourhood shopping area and a reserve beside the Barwon River. Further around the river there is the industrial area of Breakwater, which adjoins Geelong East. The Breakwater railway station was near the Geelong racecourse and showground (1907). Over thirty buildings and structures in the former Geelong city are on the Victorian Heritage Register. Notable among them are seven warehouse/commercial buildings, Christ Church (1843), St John’s Lutheran Church (1841) and the old post and telegraph offices, in addition to those previously mentioned. The art deco T&G Building on the corner of Ryrie and Moorabool Streets was converted to student accommodation for Deakin University students in 2014-15. On 18 May 1993, the Geelong city (13.4 sq km) was united with Geelong West and Newtown cities, three shires and parts of two shires to form Greater Geelong city (1252 sq km). A pilot project to restore the reefs in Port Phillip Bay and boost local shellfish and fish numbers was commenced in 2014.